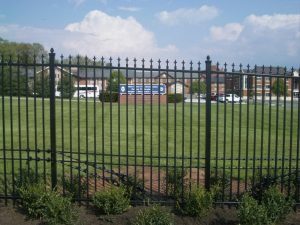 When you’re looking to add beauty and security to your Newport News Property, an ornamental iron fence is always a great idea. When you’re looking to add beauty and security to your Newport News Property, an ornamental iron fence is always a great idea. Adding a fence can help give your property an improved visual impact to help differentiate it from everything around it. Plus, iron fences come with a variety of benefits that you’ll cherish year after year. When you’re looking for a fencing option that will outlast your expectations, iron should be your first choice. While it does need maintenance to prevent rust when cared for properly it is one of the strongest and best options for long term needs. Unlike vinyl and wood, which can crack, splinter, rot, and snap in most cases iron fencing won’t be damaged by anything that hits or touches it. Over time, rust can weaken the strength of the fence, but this would take a significant amount of time. Adding a fence of any type will add to the value of your home, and an iron fence will increase this further. Iron fencing adds significant curb appeal to potential buyers and most understand that it is long-lasting, durable fencing that they will not have to replace. Depending on your design and function needs, iron fencing offers a huge range of versatile options for you to choose from. Iron fencing can be used for ornamental, security, and functional fencing depending on the style you prefer. Black may be the traditional color for an iron fence but is by no means the only option. You might also try red for a bold accent, green for something that blends with your landscaping, or white for a lux version of the classic white picket. Perhaps the most significant benefit of iron fencing over other options is that it looks great. Regardless of style, iron fences have a strong, bold, and distinct image that will improve your property dramatically. It can help put your home and landscaping appearance the same way a beautiful frame helps a piece of art. This entry was posted on Friday, January 18th, 2019 at 1:46 pm. Both comments and pings are currently closed.